A large number of Swans are known with small punctures - either 3 mm or 4 mm in diameter. 4d blue Swan with 3 mm puncture. 4d rose Swan with a 3 mm puncture. 6d brown Swan with 3 mm puncture. These punctures are generally referred to as Imperial punctures and they relate to Official Correspondence in Western Australia. Commissariat, Convict, Lunatic, Military, Chaplaincy, Invalid, Enrolled Guard, Police and part of the Magistracy". 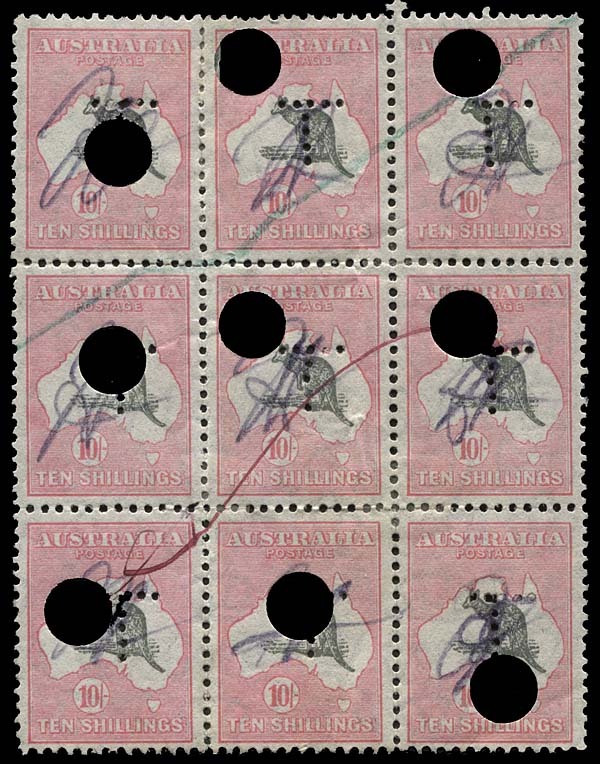 Hence despite the claims made by sellers on sites like Ebay as well as some smaller foreign auction houses, these punctured stamps have nothing to do with telegrams. The Post and Telegraph Act of 1901 required the costs of all telegrams to be pre-paid with postage stamps. This had already been the practice in New South Wales and Victoria and, at least to some extent, in Queensland and Tasmania. As the Postmaster-General's Department became more involved in management of telegraph affairs and procedures, administrative regulations required that the transmission forms were to be returned after transmission (i.e. daily) to the Chief Telegraph Office in the respective State. There they would be accounted for and the procedure was introduced for high value stamps (5/- and over) to be defaced with a puncture. 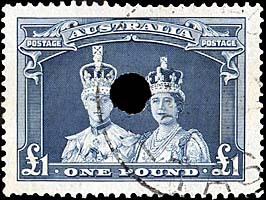 The defacing was intended to make the stamp unattractive to collectors or to those wishing to defraud the Post Office. There were quite severe penalties attached to taking these stamps. The puncturing was not to interfere with the date of lodgement. The system of daily returns continued to operate until the 1950s when Postmasters were required to keep the forms secure for 12 months and then "destroying them by fire". In 1979, the puncturing requirement was raised to stamps of face value of $1 or more. (see AB-TO-1). They finally gained acceptance and took over from the use of stamps and so the use of high denomination stamps reduced significantly. 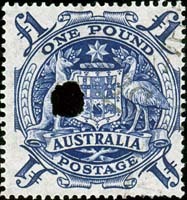 Punctures were also used on stamps used to pay telephone accounts. They can however be distinguished by having roller cancellations. Punctures were normally round although shape depended on the sharpness of the hole punch, any double punching and on the concentration of the junior clerk who was often assigned this task. Consequently the punctures could be elliptical or could have very ragged edges or could appear anywhere on the stamp. 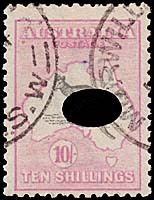 10/- light pink and grey Kangaroo on Map third watermark with 5mm double puncture (so 9 mm wide). Used at Murwillumbah, NSW. the usual puncture was 4.5-6 mm and these were produced in all States from about 1920 to 1937. Queensland produced 7-8 mm punctures from about 1916 to 1919. All punctures are 8 mm and are in different locations. 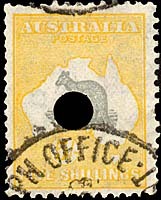 Has been cancelled with an oval date stamp (RO3) at GPO Brisbane on 14 February 1917. Extraordinary block - the largest recorded multiple. Millennium Auctions 2008 sale 38 Lot 145. 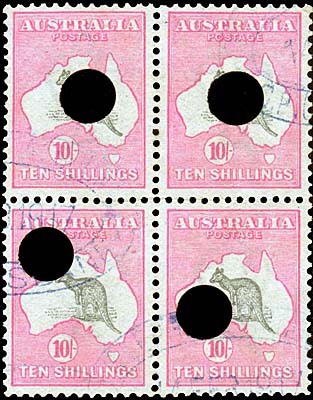 (above): 10/-grey and deep aniline pink Kangaroo on Map third watermark block of four. All punctures are 8 mm and in very different locations. Has a neat Newport/N.S.W. 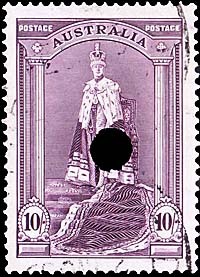 date stamp of 10 January 1919. Millennium Auctions 2008 sale 38 Lot 191. 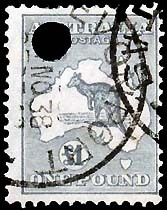 (right): £1 grey Kangaroo on Map C of A watermark vertical strip of three. All punctures are 5 mm and in different locations. 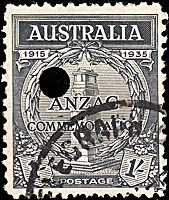 Has a Chief Telegraph Branch /Hobart date stamp of 13 September 1939. Millennium Auctions 2008 sale 38 Lot 218. 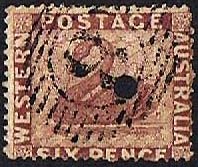 Tasmanian Stamp Auctions December 2016. A most remarkable and unique block of 9. 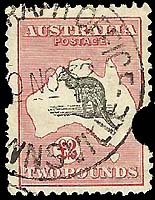 10/- grey-black and rose-crimson Kangaroo on Map printed on C of A watermarked paper. 7 mm punctures added one at a time as convenient. 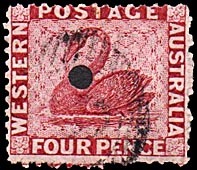 The record multiple for this stamp with these two characteristics. 10/- purple Coat of Arms (ACSC # 269). Used at Devonport 5 February 1951. 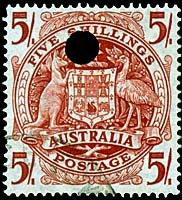 Used at Chief Telegraph Office Melbourne, 20 July 1962. Used at Chief Telegraph Office Melbourne, 24 July 1962. 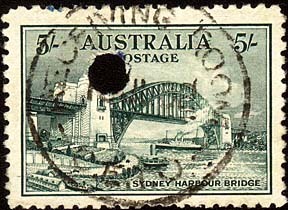 5/- green Sydney Harbour Bridge. 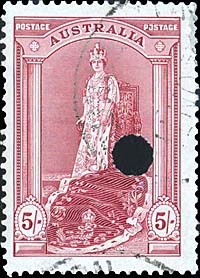 CETO date stamp of July 1932. Very scarce. Probably only three examples exist. Prestige Philately 2008 Rarities Sale 136 Lot 121. Use of 10/- Flinders and £2 King from the pre-decimal Navigators set all punctured. Highest recorded franking on a telegram (£8/10/-). Brisbane University, Queensland used on 25 January 1966 - nearly 3 weeks before the change to decimal currency. 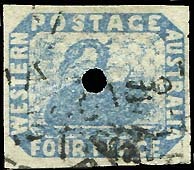 There are a number of sellers who market stamps with punctures which are either forged or of dubious value. Sometimes holes are added in a very rough way which does not reflect the type of hole which was made. The Robes pair at left has a type of manuscript cancellation with two holes of different shape and size. 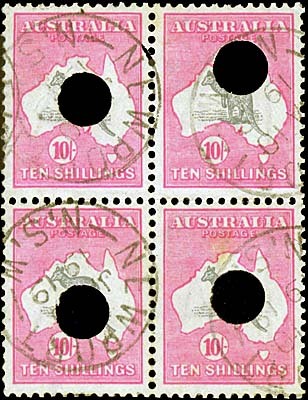 If the stamps had been on a telegram, the holes would have been much more similar - such as those on the Kangaroo on Map multiples and on the 10/- Arms pair above. 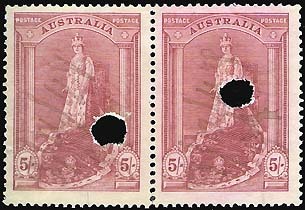 Other possible fakes are stamps with "repaired holes". Although there may have been some attempt by one or two clerks to keep the punched out pieces and illegally put them back in place later, there are far to many examples which have been "artificially created". These items should all be avoided on all grounds.